Miss Melee, by Rob Johnson and Ariel Guadalupe, is a comic that suffers from the cardinal sin of both its genre and of the independent market—the sin of wasted potential. It is average at its best, but a closer reading reveals an utter lack of substance or presence within the genre. 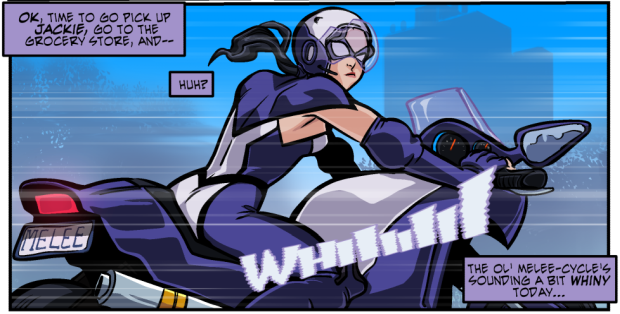 On the surface, Miss Melee is a colorful, jubilant, bouncy comic with a quick pace and some solid martial arts action that understands the importance of a sense of levity. It puts itself out there with twenty-page issues that convey a fight scene per issue so far (we’re two issues in at this point), but this is all style and no substance. In forty pages we get what feels like two scenes, when what we should be getting is something that feels like two chapters. Or even a single chapter. But this is not the case. Beneath the veneer of action and fun, what we get is an amateurish entry in the field of cape comics that doesn’t seem to fully understand what allows that genre to be enjoyable. It feels like merely an emulation of what works, and that is the sin of wasted potential. The story, thus far, is about Janice Jones—a.k.a. Miss Melee. Janice is a thirty-five-year-old businesswoman who is married to a burger chef with whom she has a daughter named Jackie. Janice has managed to keep her superhero career on the down low with her family ever since she retired from the public eye sometime before the start of the story. Miss Melee is a martial artist, and, so far, the world seems to only operate on street-level power. She punches and kicks people in her pale purple costume. The logistics of where she’s keeping her costume don’t really come up, or why she would bring her costume with her to the county fair of all places. She carries a purse with her, but her costume is clearly a full-sized outfit that wouldn’t sensibly fit in there alongside her other accouterments. This is where the flaws of Miss Melee begin to come into play. While Grant Morrison might tell us that children can accept a flying superhero isn’t reality while adults love to pick things apart, we need to have some grounding in reality for the heroic and super to seem superheroic. One of the easiest ways to do this is with a good rogue’s gallery, which, at the moment, Miss Melee lacks. The establishment of the setting as a character in and of itself, like Superman’s Metropolis or Batman’s Gotham, can also lend a degree of credibility to what we’re expecting to see. As it stands, at the moment, Miss Melee is about a martial artist who occupies a world that we’re given no reason to believe operates any differently than our own. Miss Melee lacks villains that help drive the story forward and better explain the world through their actions. The Brazilian Ninjas and their leader, Guerreira, don’t tell us much about the world beyond Miss Melee having apparently fought them in the past in what seems to be another locale—likely Brazil. Other rogues such as Lord Khairava (her old nemesis) don’t appear outside of a flashback. The supporting cast as a whole doesn’t tell us much about the world either. Janice’s husband cooks burgers and has always been out of the action. Janice’s daughter, Jackie, wants to be a sidekick to Miss Melee, her favorite superhero, but we’re not given a lot of reasons why beyond childish admiration. Others such as Osakan Riot, another retired superhero, don’t tell us anything we don’t already know, and, worse still, do not give us any additional clarity to the things we already know. This is wasted potential. Two issues in we should have some feeling for what the cast is like, but we really don’t. It feels more like we’ve seen two scenes rather than two issues worth of content. This could be further allayed if we had a greater sense for where this is all taking place. Which leads to an additional problem of wasted potential. Metrovale, as a setting with two issues under its belt, lacks any presence. It has a county fair of white tents that gives no sense of whimsy or fun in the sun. It has suburbs, it has skyscrapers, and it has a generic bank. That’s it, really. It looks like any generic metropolitan area with suburbs, but it also features such threats as the Brazilian Ninjas, and this goes against the logical buy-in, instead appearing as random. While I am not asking for the Avengers Tower or something equally "super" to be sticking out of the skyline, I am looking for a degree of purpose in an otherwise mundane city. In some cases, this could work. For example, the classic Powerpuff Girls cartoon features the City of Townsville, which is meant to look like any generic metropolis with suburbs that could come under attack by any sort of threat, be it a mega-minded monkey or a cross-dressing lobster demon. It plays up its concept for the sake of comedy, which gives Townsville its own sense of character—it exists to be saved by the titular characters from threats that were, by any other logic, random. And that in turn stopped the threats from being random, because those things happen in Townsville. We don't have much indication that this is the sort of case for Metrovale. The writing itself could make up for this, but it is disappointingly sparing at best. Aside from narrating much of what we’re seeing, it does not really show us anything that gives us context to the action. It tells us a bit during a flashback, but this raises more questions than answers, a feat that would be perfectly fine in a character-driven narrative, but Miss Melee is clearly meant to be driven by the action. Dialogue between characters feels very scripted and inorganic, as though it were trying to get across the tone of whimsy found in classic Adam West Batman. This creates a tonal dissonance with the action that occurs, which, while not down-and-out brutal, is certainly grounded in some degree of reality. Narration boxes appear to take up more space than dialogue bubbles, but they do not provide us with greater insight into who Janice is as a person. It reads like a cartoon, which could be taken as a compliment, but in this case it is meant as a note of criticism. It doesn’t read like a cartoon that best represents the genre that it is in. It doesn’t read like Justice League or The Spectacular Spider-Man, it reads like someone trying to do their best to ape the style of something more whimsical and lighthearted without the skill to back up that choice in relation to the action. This is partly why two issues feels like two scenes. They read very fast because they lack substance for me to linger on and ruminate upon. This is a comic where things happen that, if they were set upon a better foundation of setting or character, are things I could gladly accept. But sadly this is not the case. From an artistic standpoint the flaws of the work become apparent the further in you get. While Miss Melee’s art is appealing to the eyes when read in one go, closer reading shows that things get a little “goopy.” The line work takes on a weird nature, and, much like the stock facial expressions that come to inhabit the small cast, this pushes the sense that there is no constructed anatomy behind the skin of the characters. Ariel Guadalupe clearly enjoys drawing figures, and his figures in motion are quite appealing to look at. The exaggerations work fine in motion, but as soon as people stop moving and have to begin social interactions, it all goes to pot. This is a serious problem in the slower scenes where the female cast shifts between a bad case of same-face and rubber-face. The worst example of this is Osakan Riot, who looks like a variety of different characters by face alone over the course of a single phone call. It's also more easily noticed due to how the art’s quality seems to decline from the first issue to the second. The first issue of Miss Melee does a good job in terms of human anatomy, with some exaggerations that are both intentional and restrained. The second issue shows a decline in quality in these instances. Guadalupe’s apparent love for figures does not, however, distract from the near-constant lack of proper backgrounds. Gradients, bursts, and lens flare effects take hold, and what could be an interesting combat that makes use of the environment instead becomes figures fighting in blank space, where special prop use is an afterthought. Blurred backgrounds, Photoshop stamp populations, and geometric shapes for buildings do not give a sense of presence within space—which furthers my previously stated issue of setting. Furthermore, the “camera,” as it is, doesn’t seem to be pulled back often enough to allow for characters to exist in space. This is an issue that might explain the lack of backgrounds on part of the artist, and is likely due to the writer wanting to keep the action tight. But this means the comic and its characters are always in our faces, not allowing us room to breathe or digest what we’ve been given. This also causes time and the action to feel compressed, which is why two issues feels more like two scenes, and it prevents the audience from being able to appreciate the characters in moments of decompression. Two issues in, I hoped for a sense of setting and a cast of characters who gave me a reason to want to watch them. Two issues in I am provided with very little in terms of substance. The characters lack a greater degree of personality, and even their small moments of decompression go by too fast for me to know them in any substantial way. Themes that could be interesting in a piece featuring a superhero mom are, at the moment, not present, and themes that are interesting in martial arts genre pieces are also nonexistent beyond broad tropes such as a fallen master or a fight atop a mountain top. Miss Melee, two issues in, gives me as a reader little to cling to. I am not given much reason to care for what will happen next with Janice’s boss, who has a dossier on Miss Melee for likely malign purposes. While it is refreshing to see a straightly played entry of cape comics in a world of postmodern superhero deconstruction, it would be far more refreshing to see it done well. It is something you can read through quickly, and it lacks staying power. Rob Johnson and Ariel Guadalupe’s Miss Melee updates weekly on Saturdays, and it is soon to begin its third chapter.